This post will not cover the reliablity of connection for each dsl provider. Only the prices and speed are included. 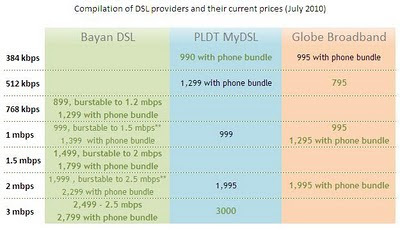 ** for 1mbps and 2mbps, if you will only be taking into account the speed Bayan DSL will because of the burstable speed during 10pm - 10am but if you will be considering also the phone bundle, globe will become much cheaper. *** Prices may change without notice. 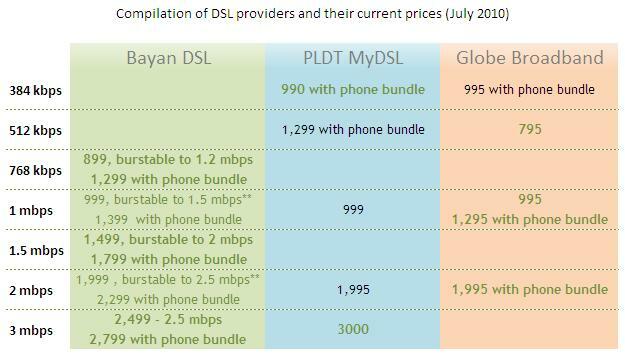 In my opinion, the over all best provider will be Bayan DSL. WIth very competitive prices, great customer service and my all time favorites S.O.D (speed on demand, burstable speed during 10pm - 10am) Bayan DSL is definitely the most cost effective DSL subscriber to date. But hey, don't forget that we also need to consider the reliablity of connection and so far I only have problems with my internet during storms. We all know that the stability of connection is dependent on several factors specially location. Share your experiences with your DSL providers on the comments section,I could update this post then. Disclaimer: I'm not, in any fashion, related to BayanDSL and Bayan services. This is purely my own opinion and is based on the user experience I received as their subscriber.